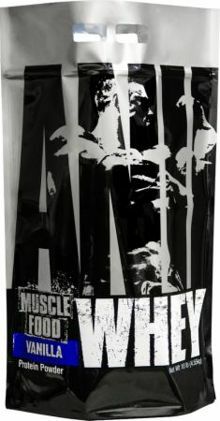 Animal Whey by Universal: Brownie Batter is a MUST-Try! This product is not for use by any individual under the age of 18. Please consult with a physician before using this product. Do not take this product if you have or are at risk for any medical condition or disease including but not limited to diabetes, asthma, depression, recurrent headaches, glaucoma, difficulty urinating, prostate enlargement, seizure disorder, high blood pressure, high cholesterol, arthritis, heart disease, stroke, are pregnant, or are suffering from any inflammatory diseases. Be sure to talk to your physician before using this product if you are using any prescription drug, overthe- counter medication, or supplements. Not for use by children, patients, pregnant or nursing women. Immediately discontinue use and consult your physician if dizziness, sleeplessness, tremors, nervousness, agitation, headache, heart palpitations, or any side effects occur. Discontinue use two weeks prior to surgery. The use of this product may be banned by some athletic associations. Athletes should consult with their sanctioning authority before use. Exercise good judgement and keep this out of reach of children. Store this product in a cool, dry place, away from heat, moisture and sunlight. Do not exceed recommended dose. Animal Whey Protein Blend [Cross Flow Micro Filtered Whey Protein Isolate, Ultra Filtrated Whey Protein Concentrate (Milk)], Natural and Artificial Strawberry and Vanilla Flavors, Cellulose Gum, Xanthan Gum, Carrageenan, Lecithin (Soy), Sodium Chloride, Natural Strawberry Pieces, Beet Powder, Acesulfame Potassium, Sucralose, Animal Whey Digestive Enzyme Blend (Papain, Bromelain). Animal Whey Protein Blend [Cross Flow Micro Filtered Whey Protein Isolate, Ultra Filtrated Whey Protein Concentrate (Milk)], Natural and Artificial Flavors, Cellulose Gum, Xanthan Gum, Carrageenan, Lecithin (Soy), Sodium Chloride, Acesulfame Potassium, Sucralose, Animal Whey Digestive Enzyme Blend (Papain, Bromelain). Animal Whey Protein Blend [Cross Flow Micro Filtered Whey Protein Isolate, Ultra Filtrated Whey Protein Concentrate (Milk)], Natural and Artificial Banana and Vanilla Flavors (Yellow #5 & 6), Lecithin (Soy), Cellulose Gum, Xanthan Gum, Carrageenan, Sodium Chloride, Acesulfame Potassium, Sucralose, Animal Whey Digestive Enzyme Blend (Papain, Bromelain). Animal Whey Protein Blend [Cross Flow Micro Filtered Whey Protein Isolate, Ultra Filtrated Whey Protein Concentrate (Milk)], Cocoa, Natural and Artificial Brownie Batter Flavors, Cookie Bits [Sugar, wheat flour, Cocoa (Processed with Alkali), Partially Hydrogenated Vegetable Oils (soybean and/or cottonseed)], Cellulose Gum, Xanthan Gum, Carrageenan, Lecithin (Soy), Sodium Chloride, Acesulfame Potassium, Sucralose, Animal Whey Digestive Enzyme Blend (Papain, Bromelain). Animal Whey Protein Blend [Cross Flow Micro Filtered Whey Protein Isolate, Ultra Filtrated Whey Protein Concentrate (Milk)], Cocoa, Natural and Artificial Flavors, Cookie Bits [Sugar, Wheat Flour, Cocoa (Processed With Alkali), Partially Hydrogenated Vegetable Oil (Soybean And/Or Cottonseed), Cellulose Gum, Xanthan Gum, Carrageenan, Lecithin (Soy), Sodium Chloride, Acesulfame Potassium, Sucralose, Animal Whey Digestive Enzyme Blend (Papain, Bromelain). Animal Whey Protein Blend [Cross Flow Micro Filtered Whey Protein Isolate, Ultra Filtrated Whey Protein Concentrate (Milk)], Cocoa, Natural and Artificial Chocolate & Coconut Flavors, Lecithin (Soy), Cellulose Gum, Xanthan Gum, Carrageenan, Sodium Chloride, Acesulfame Potassium, Sucralose, Animal Whey Digestive Enzyme Blend (Papain, Bromelain). Animal Whey Protein Blend [Cross Flow Micro Filtered Whey Protein Isolate, Ultra Filtrated Whey Protein Concentrate (Milk)], Cocoa, Natural and Artificial chocolate mint Flavors, Lecithin (Soy), Cellulose Gum, Xanthan Gum, Carrageenan, Sodium Chloride, Acesulfame Potassium, Sucralose, Animal Whey Digestive Enzyme Blend (Papain, Bromelain). Animal Whey Protein Blend [Cross Flow Micro Filtered Whey Protein Isolate, Ultra Filtrated Whey Protein Concentrate (Milk)], Natural and Artificial Flavors, Cookie Bits [Sugar, Wheat Flour, Cocoa (Processed with Alkali), Partially Hydrogenated Vegetable Oil (Soybean and/or, Cottonseed)], Cellulose Gum, Xanthan Gum, Carrageenan, Lecithin (Soy), Sodium Chloride, Acesulfame Potassium, Sucralose, Animal Whey Digestive Enzyme Blend (Papain, Bromelain). Animal Whey Protein Blend [Cross Flow Micro Filtered Whey Protein Isolate, Ultra Filtrated Whey Protein Concentrate (Milk)], Natural and Artificial Cinnamon and Vanilla Flavors, Lecithin (Soy), Cellulose Gum, Xanthan Gum, Carrageenan, Sodium Chloride, Acesulfame Potassium, Sucralose, Animal Whey Digestive Enzyme Blend (Papain, Bromelain), Cinnamon. Animal Whey Complex [Cross Flow Micro Filtered Whey Protein Isolate, Ultra Filtrated Whey Protein Concentrate (Milk)], Natural and Artificial Glazed Donut Flavors, Lecithin (Soy), Cellulose Gum, Xanthan Gum, Carrageenan, Sodium Chloride, Acesulfame Potassium, Sucralose, Animal Whey Digestive Enzyme Blend (Papain, Bromelain). Animal Whey Complex [Cross Flow Micro Filtered Whey Protein Isolate, Ultra Filtrated Whey Protein Concentrate (Milk)], Natural and Artificial Mocha Cappuccino Flavors, Lecithin (Soy), Cellulose Gum, Xanthan Gum, Carrageenan, Sodium Chloride, Acesulfame Potassium, Sucralose, Animal Whey Digestive Enzyme Blend (Papain, Bromelain). Animal Whey Protein Blend [Cross Flow Micro Filtered Whey Protein Isolate, Ultra Filtrated Whey Protein Concentrate (Milk)], Natural and Artificial Pumpkin Spice Flavors, Cellulose Gum, Xanthan Gum, Carrageenan, Lecithin (Soy), Sodium Chloride, Acesulfame Potassium, Sucralose, Animal Whey Digestive Enzyme Blend (Papain, Bromelain). Animal Whey Protein Blend [Cross Flow Micro Filtered Whey Protein Isolate, Ultra Filtrated Whey Protein Concentrate (Milk)], Natural and Artificial Red Velvet Flavors, Cellulose Gum, Xanthan Gum, Carrageenan, Lecithin (Soy), Sodium Chloride, Red #40 Lake, Acesulfame Potassium, Sucralose, Animal Whey Digestive Enzyme Blend (Papain, Bromelain). Animal Whey Complex [Cross Flow Micro Filtered Whey Protein Isolate, Ultra Filtrated Whey Protein Concentrate (Milk)], Natural and Artificial Salted Caramel Flavors, Cellulose Gum, Xanthan Gum, Carrageenan, Lecithin (Soy), Sodium Chloride, Acesulfame Potassium, Sucralose, Animal Whey Digestive Enzyme Blend (Papain, Bromelain). Animal Whey Complex [Cross Flow Micro Filtered Whey Protein Isolate, Ultra Filtrated Whey Protein Concentrate (Milk)], Natural Vanilla Flavor, Cellulose Gum, Xanthan Gum, Carrageenan, Lecithin (Soy), Sodium Chloride, Monk Fruit Extract, Steviol Glycosides (stevia), Animal Whey Digestive Enzyme Blend (Papain, Bromelain). Animal Whey Protein Blend [Cross Flow Micro Filtered Whey Protein Isolate, Ultra Filtrated Whey Protein Concentrate (Milk)], Cocoa, Natural and Artificial Flavors, Cookie Bits [Sugar, Wheat Flour, Cocoa (Processed With Alkali), Partially Hydrogenated Vegetable Oil (Soybean And/Or Cottonseed), Salt, Natural & Artificial Flavors], Cellulose Gum, Xanthan Gum, Carrageenan, Lecithin (Soy), Sodium Chloride, Acesulfame Potassium, Sucralose, Animal Whey Digestive Enzyme Blend (Papain, Bromelain). Animal Whey Complex [Cross Flow Micro Filtered Whey Protein Isolate, Whey Protein Concentrate (Milk)], Natural And Artificial Flavor, Cellulose Gum, Xanthan Gum, Carrageenan, Lecithin (Soy), Sodium Chloride, Acesulfame Potassium, Sucralose, Animal Whey Digestive Enzyme Blend (Papain, Bromelain). Animal Whey Protein Blend [Cross Flow Micro Filtered Whey Protein Isolate, Ultra Filtrated Whey Protein Concentrate (Milk)], Cocoa, Natural and Artificial Chocolate Flavor, Cellulose Gum, Xanthan Gum, Carrageenan, Lecithin (Soy), Sodium Chloride, Acesulfame Potassium, Sucralose, Animal Whey Digestive Enzyme Blend (Papain, Bromelain). Animal Whey Protein Blend [Cross Flow Micro Filtered Whey Protein Isolate, Ultra Filtrated Whey Protein Concentrate (Milk)], Natural and Artificial Cookies & Cream Flavor, Cookie Bits [Sugar, Wheat Flour, Cocoa (Processed with Alkali), Partially Hydrogenated Vegetable Oil (Soybean and/or, Cottonseed)], Cellulose Gum, Xanthan Gum, Carrageenan, Lecithin (Soy), Sodium Chloride, Acesulfame Potassium, Sucralose, Animal Whey Digestive Enzyme Blend (Papain, Bromelain). Animal Whey Protein Blend [Cross Flow Micro Filtered Whey Protein Isolate, Ultra Filtrated Whey Protein Concentrate (Milk)], Natural and Artificial Vanilla Flavor, Cellulose Gum, Xanthan Gum, Carrageenan, Lecithin (Soy), Sodium Chloride, Acesulfame Potassium, Sucralose, Animal Whey Digestive Enzyme Blend (Papain, Bromelain). One of the best whey proteins ever created! Watch Sandy fall in love with brownie batter, one of the finest chocolate flavored proteins we've ever touched! Banana Cream This is a Buy 1 Get 1 FREE offer! Brownie Batter This is a Buy 1 Get 1 FREE offer! Chocolate Chocolate Chip This is a Buy 1 Get 1 FREE offer! Chocolate Coconut This is a Buy 1 Get 1 FREE offer! Frosted Cinnamon Bun This is a Buy 1 Get 1 FREE offer! Glazed Donut This is a Buy 1 Get 1 FREE offer! Salted Caramel This is a Buy 1 Get 1 FREE offer! Frank's Birthday Cake This is a Buy 1 Get 1 FREE offer!